In 1993, artist Anselm Kiefer left Buchen, Germany for La Ribaute, a derelict silk factory near Barjac, a town in the south of France. Like a strange, sprawling village, La Ribaute extends over 35 hectares and is composed of old industrial buildings and working studios. From 2000, Kiefer began constructing a series of elaborate installations and paintings, creating pavilions to house them, while also digging a network of tunnels underneath the pavilions. 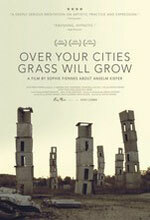 Over Your Cities Grass Will Grow takes you into Kiefer's artistic estate to discover these sights and more — including an underground pool at the cul-de-sac of a tubular iron tunnel embedded within a crypt, a 20-meter tiered concrete amphitheater, and an open landscape of concrete towers assembled like so many card houses. Traversing this landscape, director Sophie Fiennes' critcically-acclaimed film immerses the audience in the total world and creative process of one of today’s most significant and inventive artists.